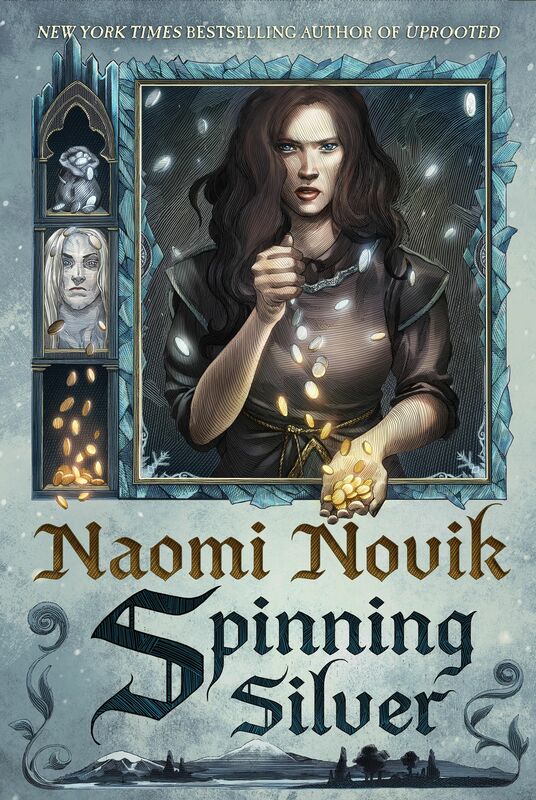 Together in one volume, here are the first three novels in Naomi Novik’s New York Times bestselling Temeraire series, combining the gripping history of the Napoleonic era, the thrill of Anne McCaffrey’s Dragonriders of Pern books, and the excitement of Patrick O’Brian’s seafaring adventures. 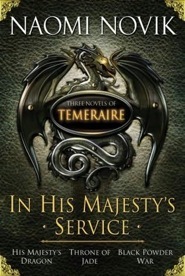 In His Majesty’s Service also includes an exclusive original Temeraire short story. Capt. Will Laurence is serving with honor in the British Navy when his ship captures a French frigate harboring most a unusual cargo–an incalculably valuable dragon egg. When the egg hatches, Laurence unexpectedly becomes the master of the young dragon Temeraire and finds himself on an extraordinary journey that will shatter his orderly, respectable life and alter the course of his nation’s history. Thrust into England’s Aerial Corps, Laurence and Temeraire undergo rigorous training while staving off French forces intent on breaching British soil. But the pair has more than France to contend with when China learns that an imperial dragon intended for Napoleon–Temeraire himself– has fallen into British hands. The emperor summons the new pilot and his dragon to the Far East, a long voyage fraught with peril and intrigue. From England’s shores to China’s palaces, from the Silk Road’s outer limits to the embattled borders of Prussia and Poland, Laurence and Temeraire must defend their partnership and their country from powerful adversaries around the globe. But can they succeed against the massed forces of Bonaparte’s implacable army? The deck of the French ship was slippery with blood, heaving in the choppy sea; a stroke might as easily bring down the man making it as the intended target. Laurence did not have time in the heat of the battle to be surprised at the degree of resistance, but even through the numbing haze of battle fever and the confusion of swords and pistol-smoke, he marked the extreme look of anguish on the French captain’s face as the man shouted encouragement to his men. It was still there shortly thereafter, when they met on the deck, and the man surrendered his sword, very reluctantly: at the last moment his hand half-closed about the blade, as if he meant to draw it back. Laurence looked up to make certain the colors had been struck, then accepted the sword with a mute bow; he did not speak French himself, and a more formal exchange would have to wait for the presence of his third lieutenant, that young man being presently engaged belowdecks in securing the French guns. With the cessation of hostilities, the remaining Frenchmen were all virtually dropping where they stood; Laurence noticed that there were fewer of them than he would have expected for a frigate of thirty-six guns, and that they looked ill and hollow-cheeked. Many of them lay dead or dying upon the deck; he shook his head at the waste and eyed the French captain with disapproval: the man should never have offered battle. Aside from the plain fact that the Reliant would have had the Amitié slightly outgunned and outmanned under the best of circumstances, the crew had obviously been reduced by disease or hunger. To boot, the sails above them were in a sad tangle, and that no result of the battle, but of the storm which had passed but this morning; they had barely managed to bring off a single broadside before the Reliant had closed and boarded. The captain was obviously deeply overset by the defeat, but he was not a young man to be carried away by his spirits: he ought to have done better by his men than to bring them into so hopeless an action. “Very good, sir,” Riley said, turning to issue the necessary orders. Laurence stepped to the railing to look down and see what damage the hull had taken. She looked reasonably intact, and he had ordered his own men to avoid shots below the waterline; he thought with satisfaction that there would be no difficulty in bringing her in to port. His hair had slipped out of his short queue, and now fell into his eyes as he looked over. He impatiently pushed it out of the way as he turned back, leaving streaks of blood upon his forehead and the sun-bleached hair; this, with his broad shoulders and his severe look, gave him an unconsciously savage appearance as he surveyed his prize, very unlike his usual thoughtful expression. The French captain did not immediately respond; he looked at his men with a miserable expression. They would of course do much better if they could be kept spread out through the lower deck, and any recapture was a practical impossibility under the circumstances; still he hesitated, drooped, and finally husked, “Je me rends,” with a look still more wretched. He descended with Riley on his heels, and found his first lieutenant waiting for him. Gibbs’s round face was still shining with sweat and emotion; he would be taking the prize into port, and as she was a frigate, he almost certainly would be made post, a captain himself. Laurence was only mildly pleased; though Gibbs had done his duty reasonably, the man had been imposed on him by the Admiralty and they had not become intimates. He had wanted Riley in the first lieutenant’s place, and if he had been given his way, Riley would now be the one getting his step. That was the nature of the service, and he did not begrudge Gibbs the good fortune; still, he did not rejoice quite so wholeheartedly as he would have to see Tom get his own ship. “Very well; what’s all this, then?” Laurence said now; the hands were clustered about an oddly placed bulkhead towards the stern area of the hold, neglecting the work of cataloging the captured ship’s stores. “Sir, if you will step this way,” Gibbs said. “Make way there,” he ordered, and the hands backed away from what Laurence now saw was a doorway set inside a wall that had been built across the back of the hold; recently, for the lumber was markedly lighter than the surrounding planks. Ducking through the low door, he found himself in a small chamber with a strange appearance. The walls had been reinforced with actual metal, which must have added a great deal of unnecessary weight to the ship, and the floor was padded with old sailcloth; in addition, there was a small coal-stove in the corner, though this was not presently in use. The only object stored within the room was a large crate, roughly the height of a man’s waist and as wide, and this was made fast to the floor and walls by means of thick hawsers attached to metal rings. Laurence could not help feeling the liveliest curiosity, and after a moment’s struggle he yielded to it. “Mr. Gibbs, I think we shall have a look inside,” he said, stepping out of the way. The top of the crate was thoroughly nailed down, but eventually yielded to the many willing hands; they pried it off and lifted out the top layer of packing, and many heads craned forward at the same time to see. Riley did not immediately answer, too busy staring, then he jerked to attention and said, hastily, “Yes, sir,” and bent to check the bindings. Laurence stepped closer and gazed down at the egg. There could hardly be any doubt as to its nature, though he could not say for sure from his own experience. The first amazement passing, he tentatively reached out and touched the surface, very cautiously: it was smooth and hard to the touch. He withdrew almost at once, not wanting to risk doing it some harm. “It is a dragon egg, then?” Laurence said. It required an effort to restrain the triumph in his voice. He bustled away, and Laurence exchanged a glance with Gibbs and Riley, moving closer so they might speak without being overheard by the lingering gawkers. “At least three weeks from Madeira with a fair wind, would you say?” Laurence said quietly. “At best, sir,” Gibbs said, nodding. Except of course he did know; there was only one possible solution, unpleasant as it might be to contemplate. Laurence watched broodingly while the egg was transferred, still in its crate, over to the Reliant: the only grim man, except for the French officers. He had granted them the liberty of the quarterdeck, and they watched the slow process glumly from the rail. All around them, smiles wreathed every sailor’s face, private, gloating smiles, and there was a great deal of jostling among the idle hands, with many unnecessary cautions and pieces of advice called out to the sweating group of men engaged in the actual business of the transfer. The egg being safely deposited on the deck of the Reliant, Laurence took his own leave of Gibbs. “I will leave the prisoners with you; there is no sense in giving them a motive for some desperate attempt to recapture the egg,” he said. “Keep in company, as well as you can. However, if we are separated, we will rendezvous at Madeira. You have my most hearty congratulations, Captain,” he added, shaking Gibbs’s hand. “Thank you, sir, and may I say, I am most sensible — very grateful — ” But here Gibbs’s eloquence, never in great supply, failed him; he gave up and merely stood beaming widely on Laurence and all the world, full of great good-will. The ships had been brought abreast for the transfer of the crate; Laurence did not have to take a boat, but only sprang across on the up-roll of the swell. Riley and the rest of his officers had already crossed back. He gave the order to make sail, and went directly below, to wrestle with the problem in privacy. But no obliging alternative presented itself overnight. The next morning he bowed to necessity and gave his orders, and shortly the midshipmen and lieutenants of the ship came crowding into his cabin, scrubbed and nervous in their best gear; this sort of mass summons was unprecedented, and the cabin was not quite large enough to hold them all comfortably. Laurence saw anxious looks on many faces, undoubtedly conscious of some private guilt, curiosity on others; Riley alone looked worried, perhaps suspecting something of Laurence’s intentions. Many smiles and some surreptitious elbowing; the little midshipman Battersea piped up in his treble voice, “Congratulations, sir!” and a quick pleased rumble went around. Laurence frowned; he understood their high spirits, and if the circumstances had been only a little different, he would have shared them. The egg would be worth a thousand times its weight in gold, brought safely to shore; every man aboard the ship would have shared in the bounty, and as captain he himself would have taken the largest share of the value. The Amitié‘s logs had been thrown overboard, but her hands had been less discreet than her officers, and Wells had learned enough from their complaints to explain the delay all too clearly. Fever among the crew, becalmed in the doldrums for the better part of a month, a leak in her water tanks leaving her on short water rations, and then at last the gale that they themselves had so recently weathered. It had been a string of exceptionally bad luck, and Laurence knew the superstitious souls of his men would quail at the idea that the Reliant was now carrying the egg that had undoubtedly been the cause of it. Another low murmur, this time disappointed, and even a few quiet groans; ordinarily he would have marked the offenders for a mild later rebuke, but as it was, he let them by. They would soon have more cause to groan. So far they had not yet understood what it meant; they merely made the mental reduction of the bounty on an unhatched egg to that paid for a feral dragonet, much less valuable. “Oh!” said Midshipman Carver, in tones of horror, as he took Laurence’s meaning; he instantly went crimson as eyes went to him, and shut his mouth tight. There was an emphasis on that ‘all’ which made it obviously a selfish suggestion, and Laurence felt himself go near purple with anger. He snapped, “We all shall, indeed, Mr. Fanshawe, unless there is any man here who is too much of a coward to make the attempt, and in that case that gentleman may explain himself to a court-martial when we put in at Madeira.” He sent an angry glare around the room, and no one else met his eye or offered a protest. He was all the more infuriated for understanding the sentiment, and for sharing it himself. Certainly no man not raised to the life could be easy at the prospect of suddenly becoming an aviator, and he loathed the necessity of asking his officers to face it. It meant, after all, an end to any semblance of ordinary life. It was not like sailing, where you might hand your ship back to the Navy and be set ashore, often whether you liked it or not. Even in times of peace, a dragon could not be put into dock, nor allowed to wander loose, and to keep a full-grown beast of nine or ten tons from doing exactly as it pleased took very nearly the full attention of an aviator and a crew of assistants besides. They could not really be managed by force, and were finicky about their handlers; some would not accept management at all, even when just-hatched, and none would accept it after their first feeding. A feral dragon could be kept in the breeding-grounds by the constant provision of food, mates, and comfortable shelter, but they could not be controlled outside, and they would not speak with men. So if a hatchling let you put it into harness, duty forever after tied you to the beast. An aviator could not easily manage any sort of estate, nor raise a family, nor go into society to any real extent. They lived as men apart, and largely outside the law, for you could not punish an aviator without losing the use of his dragon. In peacetime they lived in a sort of wild, outrageous libertinage in small enclaves, generally in the most remote and inhospitable places in all Britain, where the dragons could be given at least some freedom. Though the men of the Corps were honored without question for their courage and devotion to duty, the prospect of entering their ranks could not be appealing to any gentleman raised up in respectable society. Yet they sprang from good families, gentlemen’s sons handed over at the age of seven to be raised to the life, and it would be an impossible insult to the Corps to have anyone other than one of his own officers attempt the harnessing. And if one had to be asked to take the risk, then all; though if Fanshawe had not spoken in so unbecoming a way, Laurence would have liked to keep Carver out of it, as he knew the boy had a poor head for heights, which struck him as a grave impediment for an aviator. But in the atmosphere created by the pitiful request, it would seem like favoritism, and that would not do. He took a deep breath, still simmering with anger, and spoke again. “No man here has any training for the task, and the only fair means of assigning the duty is by lot. Naturally, those gentlemen with family are excused. Mr. Pollitt,” he said, turning to the surgeon, who had a wife and four children in Derbyshire, “I hope that you will draw the name for us. Gentlemen, you will each write your name upon a sheet here, and cast it into this bag.” He suited word to deed, tore off the part of the sheet with his name, folded it and put it into the small sack. Laurence shook his head a little at the thoughtlessness of youth; yet it might indeed be better were one of the younger men chosen, for the adjustment would be easier. Still, it would be hard to see one of the boys sacrificed to the task, and to face the outrage of their families. But the same would be true of any man here, including himself. Though he had done his best not to consider the consequences from a selfish perspective, now that the fatal moment was at hand he could not entirely suppress his own private fears. One small bit of paper might mean the wreck of his career, the upheaval of his life, disgrace in his father’s eyes. And, too, there was Edith Galman to think of; but if he were to begin excusing his men for some half-formed attachment, not binding, none of them would be left. In any case, he could not imagine excusing himself from this selection for any reason: this was not something he could ask his men to face, and avoid himself. He handed the bag to Mr. Pollitt and made an effort to stand at his ease and appear unconcerned, clasping his hands loosely behind his back. The surgeon shook the sack in his hand twice, thrust his hand in without looking, and drew out a small folded sheet. Laurence was ashamed to feel a sensation of profound relief even before the name was read: the sheet was folded over once more than his own entry had been. The emotion lasted only a moment. “Jonathan Carver,” Pollitt said. Fanshawe could be heard letting out an explosive breath, Battersea sighing, and Laurence bowed his head, silently cursing Fanshawe yet again; so promising a young officer, and so likely to be useless in the Corps. “Yes, sir,” the boy responded, a little faintly. Riley touched his hat, and the others filed out behind him. Fanshawe stood rigid and pale, hands clasped behind his back, and swallowed; his adam’s apple was prominent and bobbed visibly. Laurence made him wait sweating until his steward had restored the cabin furniture, and then seated himself and glared at him from this position of state, enthroned before the stern windows. “Now then, I should like you to explain precisely what you meant by that remark earlier, Mr. Fanshawe,” he said. “Oh, sir, I didn’t mean anything,” Fanshawe said. “It is only what they say about aviators, sir–” He stumbled to a stop under the increasingly militant gleam in Laurence’s eye. But despite his words, he paced the cabin after Fanshawe had gone. He had been severe, and rightly so, for it was very unbecoming in the fellow to speak in such a way, and even more to hint that he might be excused for his birth. But it was certainly a sacrifice, and his conscience smote him painfully when he thought of the look on Carver’s face. His own continued feelings of relief reproached him; he was condemning the boy to a fate he had not wanted to face himself. He tried to comfort himself with the notion that there was every chance that the dragon would turn its nose up at Carver, untrained as he was, and refuse the harness. Then no possible reproach could be made, and he could deliver it for the bounty with an easy conscience. Even if it could only be used for breeding, the dragon would still do England a great deal of good, and taking it away from the French was a victory all on its own; personally he would be more than content with that as a resolution, though as a matter of duty he meant to do everything in his power to make the other occur. The next week passed uncomfortably. It was impossible not to perceive Carver’s anxiety, especially as the week wore on and the armorer’s attempt at the harness began to take on a recognizable shape, or the unhappiness of his friends and the men of his gun-crew, for he was a popular fellow, and his difficulty with heights was no great secret. Mr. Pollitt was the only one in good humor, being not very well informed as to the state of the emotions on the ship, and very interested in the harnessing process. He spent a great deal of time inspecting the egg, going so far as to sleep and eat beside the crate in the gunroom, much to the distress of the officers who slept there: his snores were penetrating, and their berth was already crowded. Pollitt was entirely unconscious of their silent disapproval, and he kept his vigil until the morning when, with a wretched lack of sympathy, he cheerfully announced that the first cracks had begun to show. Laurence at once ordered the egg uncrated and brought up on deck. A special cushion had been made for it, out of old sailcloth stuffed with straw; this was placed on a couple of lockers lashed together, and the egg gingerly laid upon it. Mr. Rabson, the armorer, brought up the harness: it was a makeshift affair of leather straps held by dozens of buckles, as he had not known enough about the proportions of dragons to make it exact. He stood waiting with it, off to the side, while Carver positioned himself before the egg. Laurence ordered the hands to clear the space around the egg to leave more room; most of them chose to climb into the rigging or onto the roof of the roundhouse, the better to see the process. It was a brilliantly sunny day, and perhaps the warmth and light was encouraging to the long-confined hatchling; the egg began to crack more seriously almost as soon as it was laid out. There was a great deal of fidgeting and noisy whispering up above, which Laurence chose to ignore, and a few gasps when the first glimpse of movement could be seen inside: a clawed wingtip poking out, talons scrabbling out of a different crack. The end came abruptly: the shell broke almost straight down the middle and the two halves were flung apart onto the deck, as if by the occupant’s impatience. The dragonet was left amid bits and pieces, shaking itself out vigorously on the pillow. It was still covered with the slime of the interior, and shone wet and glossy under the sun; its body was a pure, untinted black from nose to tail, and a sigh of wonder ran around the crew as it unfurled its large, six-spined wings like a lady’s fan, the bottom edge dappled with oval markings in grey and dark glowing blue. Laurence himself was impressed; he had never seen a hatchling before, though he had been at several fleet actions and witnessed the grown dragons of the Corps striking in support. He did not have the knowledge to identify the breed, but it was certainly an exceedingly rare one: he did not recall ever seeing a black dragon on either side, and it seemed quite large, for a fresh-hatched creature. That only made the matter more urgent. “Mr. Carver, when you are ready,” he said. The dragonet paid him no attention whatsoever. It was occupied in examining itself and picking off bits of shell that had adhered to its hide, in a fastidious sort of way. Though it was barely the size of a large dog, the five talons upon each claw were still an inch long and impressive; Carver looked at them anxiously and stopped an arm’s length away. Here he stood waiting dumbly; the dragon continued to ignore him, and presently he cast an anxious look of appeal over his shoulder at where Laurence stood with Mr. Pollitt. “Perhaps if he were to speak to it again,” Mr. Pollitt said, dubiously. “Pray do so, Mr. Carver,” Laurence said. The boy nodded, but even as he turned back, the dragonet forestalled him by climbing down from its cushion and leaping onto the deck past him. Carver turned around with hand still outstretched and an almost comical look of surprise, and the other officers, who had drawn closer in the excitement of the hatching, backed away in alarm. “Hold your positions,” Laurence snapped. “Mr. Riley, look to the hold.” Riley nodded and took up position in front of the opening, to prevent the dragonet’s going down below. But the dragonet instead turned to exploring the deck; it flicked out a long, narrow forked tongue as it walked, lightly touching everything in its reach, and looked around itself with every evidence of curiosity and intelligence. Yet it continued to ignore Carver, despite the boy’s repeated attempts to catch its attention, and seemed equally uninterested in the other officers. Though it did occasionally rear up onto its hind legs to peer at a face more closely, it did as much to examine a pulley, or the hanging hourglass, at which it batted curiously. Laurence felt his heart sinking; no one could blame him, precisely, if the dragonet did not show any inclination for an untrained sea-officer, but to have a truly rare dragonet caught in the shell go feral would certainly feel like a blow. They had arranged the matter from common knowledge, bits and pieces out of Pollitt’s books, and from Pollitt’s own imperfect recollection of a hatching which he had once observed; now Laurence feared there was some essential step they had missed. It had certainly seemed strange to him that the dragonet should be able to begin talking at once, freshly hatched. They had not found anything in the texts describing any specific invitation or trick to induce the dragonet to speak, but he should certainly be blamed, and blame himself, if it turned out there had been something omitted. A low buzz of conversation was spreading as the officers and hands felt the moment passing. Soon he would have to give it up and take thought to confining the beast, to keep it from flying off after they fed it. Still exploring, the dragon came past him; it sat up on its haunches to look at him inquisitively, and Laurence gazed down at it in unconcealed sorrow and dismay. Silence fell at once, and it was only with difficulty that Laurence kept from gaping at the creature. Carver, who must have been thinking himself reprieved by now, was standing behind the dragon, mouth open; his eyes met Laurence’s with a desperate look, but he drew up his courage and stepped forward, ready to address the dragon once more. And now Laurence found himself completely blank. He had not given any real thought to the process of harnessing at all, beyond doing his best to see that it occurred, and he had no idea what an appropriate name might be for a dragon. After an awful moment of panic, his mind somehow linked dragon and ship, and he blurted out, “Temeraire,” thinking of the noble dreadnought which he had seen launched, many years before: that same elegant gliding motion. He cursed himself silently for having nothing thought-out, but it had been said, and at least it was an honorable name; after all, he was a Navy man, and it was only appropriate– But he paused here in his own thoughts, and stared at the dragonet in mounting horror: of course he was not a Navy man anymore; he could not be, with a dragon, and the moment it accepted the harness from his hands, he would be undone. Temeraire inspected the harness which Laurence held out to him, his flat tongue slipping out to taste it. “Very well,” he said, and stood expectantly. Resolutely not thinking beyond the immediate task, Laurence knelt and fumbled with the straps and buckles, carefully passing them around the smooth, warm body, keeping well clear of the wings. The broadest band went around the dragon’s middle, just behind the forelegs, and buckled under the belly; this was stitched crosswise to two thick straps that ran along the dragon’s sides and across the deep barrel of its chest, then back behind the rear legs and underneath its tail. Various smaller loops had been threaded upon the straps, to buckle around the legs and the base of the neck and tail, to keep the harness in place, and several narrower and thinner bands strapped across its back. The complicated assemblage required some attention, for which Laurence was grateful; he was able to lose himself in the task. He noted as he worked that the scales were surprisingly soft to the touch, and it occurred to him that the metal edges might bruise. “Mr. Rabson, be so good as to bring me some extra sailcloth; we shall wrap these buckles,” he said, over his shoulder. Shortly it was all done, although the harness and the white-wrapped buckles were ugly against the sleek black body, and did not fit very well. But Temeraire made no complaint, nor about having a chain made fast from the harness to a stanchion, and he stretched his neck out eagerly to the tub full of steaming red meat from the fresh-butchered goat, brought out at Laurence’s command. He turned and looked at his lieutenant, then at the staring, dismayed midshipmen; no one had spoken or moved since the hatching, which, he realized abruptly, had been less than half an hour ago; the hourglass was just emptying now. It was difficult to believe; still more difficult to fully acknowledge that he was now in harness, but difficult or not, it had to be faced. Laurence supposed he could cling to his rank until they reached shore; there were no regulations for a situation such as this one. But if he did, a new captain would certainly be put into his place when they reached Madeira, and Riley would never get his step up. Laurence would never again be in a position to do him any good. “Oh, sir!” Riley said, miserably, but not protesting; evidently the idea had occurred to him as well. But his regret was obviously sincere; he had sailed with Laurence for years, and had come up to lieutenant in his service from a mere midshipman; they were friends as well as comrades. Taking a deep breath, he removed his gold epaulettes; they were pinned on securely, but he had not been wealthy when he had first made captain, and he had not forgotten, from those days, how to shift them easily from one coat to another. Though perhaps it was not entirely proper to give Riley the symbol of rank without confirmation by the Admiralty, Laurence felt it necessary to mark the change of command in some visible manner. The left he slipped into his pocket, the right he fixed on Riley’s shoulder: even as a captain, Riley could wear only one until he had three years’ seniority. Riley’s fair, freckled skin showed every emotion plainly, and he could hardly fail to be happy at this unexpected promotion despite the circumstances; he flushed up with color, and looked as though he wished to speak but could not find the words. “Mr. Wells,” Laurence said, hinting; he meant to do it properly, having begun. The third lieutenant started, then said a little weakly, “Huzzah for Captain Riley.” A cheer went up, ragged initially, but strong and clear by the third repetition: Riley was a highly competent officer, and well-liked, even if it was a shocking situation. When the cheering had died down, Riley, having mastered his embarrassment, added, “And huzzah for–for Temeraire, lads.” The cheering now was full-throated, if not entirely joyful, and Laurence shook Riley’s hand to conclude the matter. These being brought, he endeavored to clean away the traces of the messy meal from the glossy black hide; Temeraire submitted with evident pleasure to being wiped down, and afterwards appreciatively rubbed the side of his head against Laurence’s hand. Laurence found himself smiling involuntarily and stroking the warm black hide, and Temeraire settled down, tucked his head into Laurence’s lap, and went to sleep. “Thank you, Tom; and no, I am comfortable enough here for the moment; best not to stir him unless necessary, I should think,” Laurence said, then belatedly thought that it might not make it easier on Riley, having his former captain sitting on deck. Still, he was not inclined to shift the sleeping dragonet, and added only, “If you would be so kind as to have someone bring me a book, perhaps one of Mr. Pollitt’s, I should be much obliged,” thinking this would both serve to occupy him, and keep him from seeming too much an observer. Laurence had already begun reassessing the ship’s supply before the hatching; now he had to revise once again as he watched Temeraire devour the remainder of the goat and two hastily sacrificed chickens, bones and all. So far in two feedings, the dragonet had consumed his body’s weight in food; he appeared already somewhat larger, and he was looking about for more with a wistful air. Laurence had a quiet and anxious consultation with Riley and the ship’s cook. If necessary, they could hail the Amitié and draw upon her stores: because her complement had been so badly reduced by her series of disasters, her supplies of food were more than she would need to make Madeira. However, she had been down to salt pork and salt beef, and the Reliant was scarcely better-off. At this rate, Temeraire should eat up the fresh supplies within a week, and Laurence had no idea if a dragon would eat cured meat, or if the salt would perhaps not be good for it. “Would he take fish?” the cook suggested. “I have a lovely little tunny, caught fresh this morning, sir; I meant it for your dinner. Oh–that is–” He paused, awkwardly, looking back and forth between his former captain and his new. “By all means let us make the attempt, if you think it right, sir,” Riley said, looking at Laurence and ignoring the cook’s confusion. Temeraire looked at the fish dubiously, then nibbled; shortly the entire thing from head to tail had vanished down his throat: it had been a full twelve pounds. He licked his chops and said, “It is very crunchy, but I like it well enough,” then startled them and himself by belching loudly. He took Temeraire down to the cabin afterwards; the ladder presented a bit of a problem, and in the end he had to be swung down by an arrangement of pulleys attached to his harness. Temeraire nosed around the desk and chair inquisitively, and poked his head out of the windows to look at the Reliant‘s wake. The pillow from the hatching had been placed into a double-wide hanging cot for him, slung next to Laurence’s own, and he leapt easily into it from the ground. His eyes almost immediately closed to drowsy slits. Thus relieved of duty and no longer under the eyes of the crew, Laurence sat down with a thump in his chair and stared at the sleeping dragon, as at an instrument of doom. He had two brothers and three nephews standing between himself and his father’s estate, and his own capital was invested in the Funds, requiring no great management on his part; that at least would not be a matter of difficulty. He had gone over the rails a score of times in battle, and he could stand in the tops in a gale without a bit of queasiness: he did not fear he would prove shy aboard a dragon. But for the rest–he was a gentleman and a gentleman’s son. Though he had gone to sea at the age of twelve, he had been fortunate enough to serve aboard first- or second-rate ships of the line for the most part of his service, under wealthy captains who kept fine tables and entertained their officers regularly. He dearly loved society; conversation, dancing, and friendly whist were his favorite pursuits; and when he thought that he might never go to the opera again, he felt a very palpable urge to tip the laden cot out the windows. He tried not to hear his father’s voice in his head, condemning him for a fool; tried not to imagine what Edith would think when she heard of it. He could not even write to let her know. Although he had to some extent considered himself committed, no formal engagement had ever been entered upon, due first to his lack of capital and more recently his long absence from England. He had done sufficiently well in the way of prize-money to do away with the first problem, and if he had been set ashore for any length of time in the last four years, he most likely would have spoken. He had been half in mind to request a brief leave for England at the end of this cruise; it was hard to deliberately put himself ashore when he could not rely upon getting another ship afterwards, but he was not so eligible a prospect that he imagined she would wait for him over all other suitors on the strength of a half-joking agreement between a thirteen-year-old boy and a nine-year-old girl. Now he was a poorer prospect indeed; he had not the slightest notion how and where he might live as an aviator, or what sort of a home he could offer a wife. Her family might object, even if she herself did not; certainly it was nothing she had been led to expect. A Navy wife might have to face with equanimity her husband’s frequent absences, but when he appeared she did not have to uproot herself and go live in some remote covert, with a dragon outside the door and a crowd of rough men the only society. He had always entertained a certain private longing for a home of his own, imagined in detail through the long, lonely nights at sea: smaller by necessity than the one in which he had been raised, yet still elegant; kept by a wife whom he could trust with the management of their affairs and their children both; a comfortable refuge when he was at home, and a warm memory while at sea. Every feeling protested against the sacrifice of this dream; yet under the circumstances, he was not even sure he could honorably make Edith an offer which she might feel obliged to accept. And there was no question of courting someone else in her place; no woman of sense and character would deliberately engage her affections on an aviator, unless she was of the sort who preferred to have a complacent and absent husband leaving his purse in her hands, and to live apart from him even while he was in England; such an arrangement did not appeal to Laurence in the slightest. The sleeping dragon, swaying back and forth in his cot, tail twitching unconsciously in time with some alien dream, was a very poor substitute for hearth and home. Laurence stood and went to the stern windows, looking over the Reliant‘s wake, a pale and opalescent froth streaming out behind her in the light from the lanterns; the ebb and flow was pleasantly numbing to watch. His steward Giles brought in his dinner with a great clatter of plate and silver, keeping well back from the dragon’s cot. His hands trembled as he laid out the service; Laurence dismissed him once the meal was served and sighed a little when he had gone; he had thought of asking Giles to come along with him, as he supposed even an aviator might have a servant, but there was no use if the man was spooked by the creatures. It would have been something to have a familiar face. In solitude, he ate his simple dinner quickly; it was only salt beef with a little glazing of wine, as the fish had gone into Temeraire’s belly, and he had little appetite in any case. He tried to write some letters, afterwards, but it was no use; his mind would wander back into gloomy paths, and he had to force his attention to every line. At last he gave it up, looked out briefly to tell Giles he would take no supper this evening, and climbed into his own cot. Temeraire shifted and snuggled deeper within the bedding; after a brief struggle with uncharitable resentment, Laurence reached out and covered him more securely, the night air being somewhat cool, and then fell asleep to the sound of his regular deep breathing, like the heaving of a bellows.